For most foreigners a journey to Russia starts and ends in Moscow or St. Petersburg. Brave Irish journalist Bryan MacDonald reached the eastern edge of Russia. He explored Khabarovsk, survived and shares his experience with RBTH. Cultural exchanges between the Brits and Irish frequently happen in pubs, from Budapest to Benidorm. I hadn't bargained on the fact they can also take place in the farthest reaches of Siberia. Much to my surprise, I encountered a small army of Brits in what to westerners is a hidden gem that is the capital of Russia’s remote Far East. The tropical tourist mecca of Bangkok is a shorter flight from Khabarovsk than Moscow. There are often more daily flights to Thailand than the Russian capital from the city, that is geographically located in Asia and very far from Moscow, (3,700 miles) but nonetheless feels very European. This Russian city of around 600,000 souls, is a mere 10 miles from China. If you didn’t know this fact, you'd never guess it from hiking around the city, but the place is as resolutely European as Southampton, 7,000 miles away. Right on cue, dozens of men enter Pool Bar (Lenina, 33) and ask the bartender, Sasha, to switch on the Manchester United game. Lancashire looks sunny on TV. Although it is 10pm in Khabarovsk, the live match is a midday kick off back in England. Then the penny drops, these are not Russians. They are Brits. Almost all of them. “Irish, are you?” asks John, as he orders a pint of Guinness (300Rub, £4.10). My accent ruins my attempt to stay incognito, and I answer in the affirmative. “Ah great, we’ve a few Irish boys on the job but most of us are Brits.” What job? “We work on the oil and gas in Sakhalin. Sakhalin’s a tad dull, so we usually fly over to Khab for a bit of fun. It’s a great town for nightlife.” I hadn’t expected to find Brits in the Russian Far East. Soon I was to discover it's full of them. At Harley (Muravyova-Amurskogo, 5), a fun mixture of a biker bar, Irish pub and rock club, I hear more English accents. While a bizarre Russian barn-dance show takes place around the venue, Kevin, from Hull, explains that his group is separate from the Sakhalin crew. “We’re working at a gold mine in Biro. You meet lots of Brits here at the weekends, but we are outnumbered by the Spanish, Croatians and Turks, there’s hundreds of them,” Kevin says. The Biro he mentions is Birobidzhan, the nearby capital of the Jewish Autonomous Oblast. Conceived by Stalin as a Zionist worker’s paradise, the city is a four-hour drive from Khabarovsk. On Harley’s hopping patio, I encounter the Spanish. Some are even wearing Sombreros, which I had assumed were Mexican in origin. Antonio, from Zaragoza, tells me they are building an oil refinery. “It beats Spain, there’s work. But it’s freezing in winter,” he confides. Antonio’s weather warning is not idle chatter. Khabarovsk has an extreme climate; January lows average -24 but can reach -39 and July high’s, +30. To further complicate matters, it is generally humid year round. If visiting in winter, don’t expect North Face to save you and bring good winter boots, I didn’t and came to regret it. Khabarovsk is a bustling city, with museums (the best in eastern Russia) and many quality hotels. The best located is Amur (Lenina, 29, rooms from £55), housed in a lovingly restored, Japanese-built, 19th century building. Some local eateries are of an extremely high standard. Chocolate (Turgeneva, 74, mains from £7), with friendly staff, including English speaking hostess Julia, offers exquisite views of Kosmolskaya Square and the 60-metre high Uspensky Cathedral. And don't miss The Far East Regional Museum (Shevchenko 11), which houses over 500,000 artefacts and even has English-language descriptions. Given the proximity to China, you’d expect a lively Chinese market. The one on Vyborgskaya street doesn’t disappoint. For souvenirs, Tainy Remesla (Muravyov-Amursky, 17) sells, in addition to the usual trinkets, artwork by indigenous Far Eastern tribes. A boat trip to the home village of the Nanai people, Sikachi-Alyan, (70km from the city) is well worth the trip to see its highlight, ancient petroglyphs, carved into stones on the banks of Amur, that are around 20,000-years-old. Back in Khabarovsk, if you are there during summer, it’s worth checking out the beachfront cafes along the Amur. Also, consider taking the two-hour journey to the Durminskoye Reserve to see the impressive Amur Tigers. Russia is one the few places where the rare tiger's population is increasing and locals are justifiably proud of the fact. Almost every entity in the city from the bus company to the professional KHL Ice Hockey team uses the Amur Tiger as a symbol. 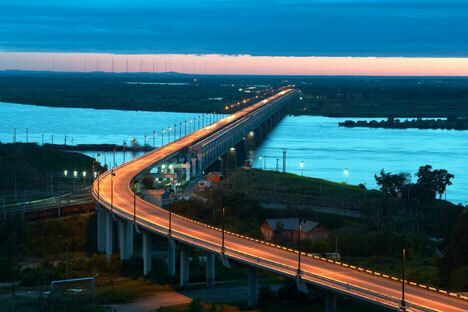 For motorcycle enthusiasts, the Khabarovsk-Chita highway, which Russian President Vladimir Putin is famed for having driven the entire 1,300 mile length, is a must. The more adventurous could veer off at the brilliantly named Bolshoi Never and head for Yaktusk, one of the coldest cities in the world. For those tired of the well-worn tourist routes, Khabarovsk is definitely worth a visit. Brits who take the challenge will be surprised to discover how many of their fellow countrymen are already there. As remote as it is from Moscow, Khabarovsk has had no shortage of famous residents and visitors. David Bowie spent time here in the 1970s, following a Japanese concert tour and thelocal Platinum Arena has hosted shows featuring Gary Moore, Roxette and Deep Purple. China's final hereditary ruler (featured in The Last Emperor starring Peter O'Toole), Puyi, lived in the city from 1945-50. As a prisoner of the Soviet Union Puyi had no say in the matter, but today Chinese tourists come by choice, more than a million every year. A famous 'local' was the late North Korean dictator, Kim Jong il, who was born in Khabarovsk in 1941, as Yuri Irsenovich Kim. Pyongyang's version places his birth at Baekdu Mountain, foretold by a swallow, heralded by a double rainbow and a new star in the heavens. As fascinating as that sounds, the Russians have a birth certificate that proves otherwise.